2007 Chevy Express 1500 4.3L clutch fan removal? I have a 2007 Chevy Express 1500 with a 4.3L. I been trying to remove the clutch fan in it. I have the correct wrenches etc. 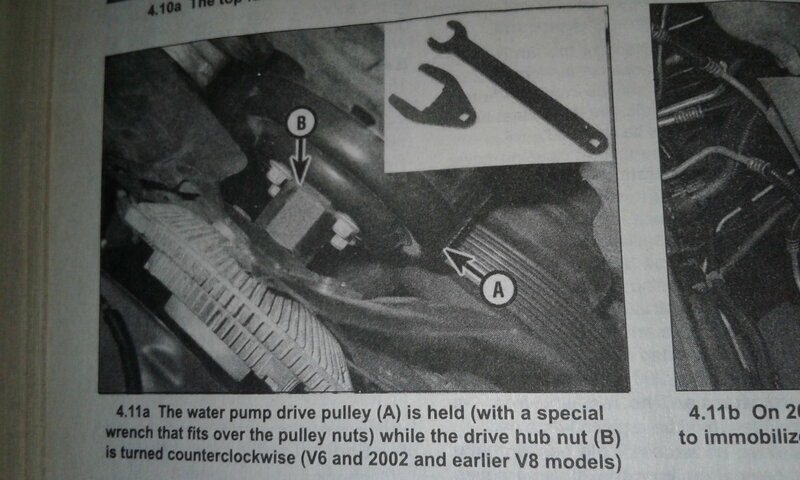 I just need to know which way do i turn the nut on the clutch fan to loosen it? Facing the vehicle the fan rotates counterclockwise. So I am guessing that the nut needs to be turned clockwise to the right (driverside) to loosen? Really would appreciate the help. And it seems the GM service manual doesn't really mention it either. Thanks! I just need to know which way do i turn the nut on the clutch fan to loosen it? Righty tighty, lefty loosie. Counterclockwise. Thanks for quick reply. I will give it a try tomorrow. I just find it odd that the nut will loosen the same direction the fan is spinning. Is that because there is a reverse thread on the fan? Hi, there are a couple YouTube videos if you Google it. You are referring to "B", right? Here is a Blazer video, pretty sure the van is very similar. My grinder and circular saw are the same. They turn CCW. If you think about it, the greatest acceleration is when the motor starts up. The inertia of the blades actually tightens it down. It's like that by design. The trouble is getting the pulley not to slide. We took out one of the 4 small bolts and drilled a hole in a piece of flat steel. Then bolted the flat steel to the pulley. That became the pulley wrench. I did what canucklehead said a few years ago. It really works. Thanks guys, well it was a long fight. I just couldn't get the clutch fan off. I had to end up removing the entire water pump, with fan and everything still attached. It has over 250K miles on it. So i just decided to replace the water pump at the same time. After removing the water pump I tried to beat the crap out of the nut. Still nothing. I said screw it and I sliced a cut in the nut with a dremel tool. Finally it came off. (counterclockwise) like Twscarp suggested. Looks like the factory must have put locktite on the threads. No wonder it wouldn't come off. It was frozen on there pretty good. But finally got the new water pump and clutch fan all back on there and its working fine now. Long day started at 8am and took me all the way until 8pm until i was done. Taking breaks here and there running for parts. I appreciate all the help. It was probably the right move to replace the water pump when you were in there, with that many miles. The key in your case was holding the pulley side tight, then wacking the clutch fan nut. Did you find a good way to hold the pulley side even out of the van? canucklehead's method sounds pretty good. Last edited by Twscarp; October 21st, 2018 at 6:29 AM.